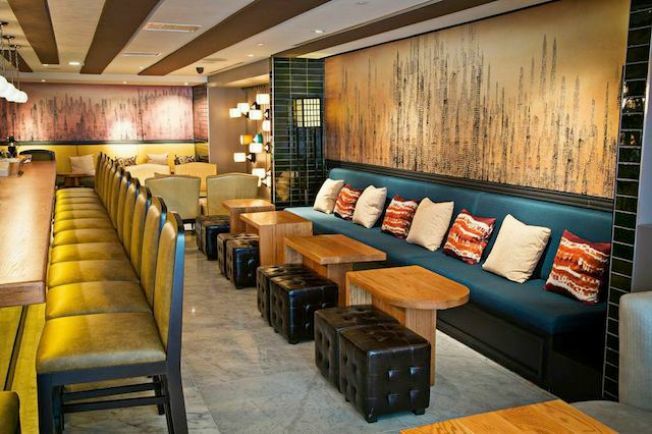 Kimpton Hotels spent $600,000 to refresh Urbana (2121 P St. NW), the beneath-sidewalk-level restaurant in Dupont Circle, which reopened with style earlier this month. Having removed the previous barriers that condensed the space, architects took inspiration from the 1920s Art Deco cityscape to create a spacious double-sided bar, drink rails and additional high-top lounge seating with great lighting. Additionally, Executive Chef Ethan McKee revamped Urbana's menu, taking inspiration from the Mediterranean. The bar bites menu now includes oysters, composed crudo plates and small fish dishes, such as porcini arancini and fritti misti, while the dining room will have an Italian-focused menu, heavy on pastas. Antipasti selections include a red snapper crudo with baby arugula, kohlrabi, sweet pepper and trout roe; marinated sardines with basil, pine nuts, capers, chili oil and crostini; gnocchi with pesto butter, fairytale eggplant and heirloom tomatoes, and burrata with balsamic-infused beets, vin cotto and arugula salad. Pastas -- house-made, naturally -- include squid ink bucatini with calamari, shrimp, mussels and bagna cauda; agnolottii with ricotta, caramelized onions, kale, carrot puree and parmesan; and mezzaluna with pork cheeks, guanciale, chanterelles and black truffle. Secondi selections will include whole roasted dorade with chard, cipollini onions, fennel puree and hazelnut brown butter; chicken finished in the brick oven with shell beans, charred lemon, crispy sage and salsa verde, and roasted hearts of palm with rapini, red quinoa, salsa rossa and pine nuts. Those seeking Italian-leaning craft cocktails will be pleased that Lee Carrell has also revamped the craft cocktail program to focus heavily on amari, grappa and house-made ingredients. Highlights include the Show Down With High West with double rye, Cardamaro, fresh pear juice and mole bitters ($13); the Nettare, with No. 3 Gin and a house-made rosemary and lychee soda ($12); and the Trident, with cynar, fino sherry, akavit and peach bitters ($11). Finally, it's worth noting that the Urbana wine program recently earned the prestigious Wine Spectator Award of Excellence, so guests can enjoy a strong selection of Old and New World wines chosen to pair with a menu focusing on pastas and updated Italian classics.